Since raising the excise duty on alcohol significantly in 2010, Indonesia has experienced an increase in homebrewed and black-market alcoholic drinks. However, people drinking this unregulated alcohol often become ill and there have been numerous reported fatalities. This project developed in response to the situation in Indonesia. Through a series of workshops and exhibitions, this project aims to educate people on how to make safe and cheap fermented alcohol beverages, while democratizing the laboratory and liberating knowledge for a wider society. 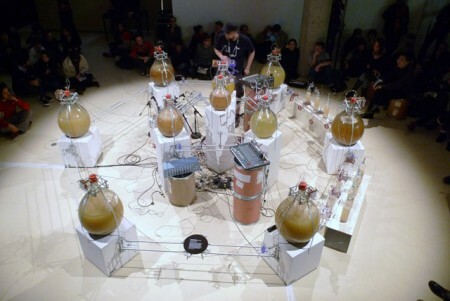 The sound installation draws attention to the complexity of the fermentation process, permitting the audience to listen to the sound of fermentation, as yeast transforms sugar into ethanol and CO2. The sounds generated depend on a multitude of variables within the production process, including temperature, sugar levels, the types of fruit being used, the quantity of yeast, light intensity and the size of the containers used. This project was a collaboration between the artists’ initiative House of Natural Fiber and the Microbiology Lab of FAPERTA, UGM (Agricultural Faculty, Gadjah Mada University). Both parties wanted to experiment on ways of solving problems within the environment that they are living in through the junction of art and science. I am listing this project on my website as I was a member of HONF when this collaboration happened; and this project served a foundational approach for my further enquiries on the idea of preservation. 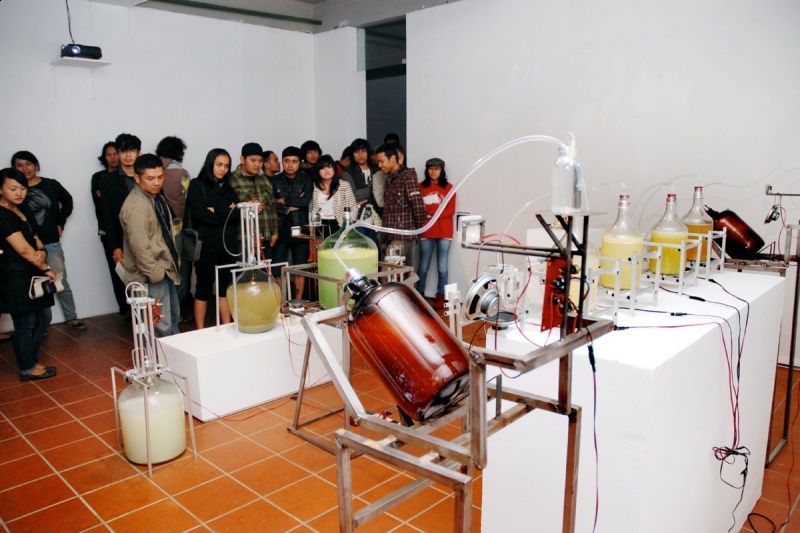 FIXER, North Art Space, Jakarta, 2010, curated by Ade Darmawan & Rifky Effendy.